Ten top optics companies came together to give attendees a crystal-clear view of today’s diverse options. When the ASC Technology Committee Lens Subcommittee was formed late last fall, one of the first tasks bestowed upon the group by ASC President Kees van Oostrum was the planning of a “Spherical Lens Day,” which would serve as a follow up to the “Anamorphic Lens Day” held at the ASC Clubhouse about two years ago. As the co-chair of the subcommittee, and with co-chair Michael McDonough, ASC, BSC off shooting a project, the honor and responsibility for organizing this event fell to me alongside the ASC's own Patricia Armacost and Alex Lopez. Duclos Lenses generously sponsored the event, and Paul Duclos and Matt Duclos were on-hand — along with several members of their highly knowledgeable staff — to provide assistance, coordination and answer questions. The concept of the event was to bring together as many of the top lens manufacturers as we could to the Clubhouse and provide evaluation stations where ASC members and associates could view and test lenses of their choosing. With limited space inside the Clubhouse, the decision was made to limit the number of participating companies to just 10: Angenieux, Arri / Arri Rental, Canon, Cooke, CW Sonderoptics/Leica, Fujifilm, Panavision, Schneider, Vantage and Zeiss. Each company brought their arsenal of optics — new and vintage. Arri and Arri Rental, alone, came armed with three dozen lens options, and Panvision followed with nearly just as many. Setting up in Billy's Bar with a Cooke Panchro. The three evaluation stations were set up on the courtyard patio, inside “Billy’s Bar” and in front of the fireplace in the central meeting area of the Clubhouse. Each provided unique opportunities to evaluate and stress test the lenses provided by the manufacturers. Outside, three cameras were set up side-by-side: an Arri Alexa SXT with a PL mount, an Arri Alexa XT with a PV mount and a Red Weapon 8K with a PL mount. All three were fed into a Canon DP-V2420 1000 nit 4K reference monitor, situated inside of a blackout tent, for HDR viewing. In front of the lenses was a live model situated under an 8'x8' gridcloth next to an 8'x8' Ultrabounce and a Kino Flo Celeb 450 LED fixture. Behind the model hung a curtain of acrylic crystals set back a ways to evaluate each lens’ bokeh. Michael Cioni of Panavision/Light Iron sets up a new lens on an 8K Millennium DXL camera. Inside the Clubhouse, in front of the fireplace, were two cameras side-by-side: An Arri Alexa 65 and a Panavision DXL. This was our “large format” area, where Arri could showcase their Prime DNA, Prime S, 765 and XPL-mounted Leica Thalia lenses on the large sensor. Panavision also showcased their brand-new Artiste lenses along with Primo 70, Sphero, and System 70 lenses designed for the larger DXL format. A live model sat dutifully at a table in front of the Clubhouse's entrance, backlit with hard, raw sunlight through the glass doorway. From the front, she was lit with an Arri Skypanel 120 LED fixture through full grid cloth. A selection of lenses in the Pavilion. Inside “Billy’s Bar” — named for the great William A. Fraker, ASC, BSC — was another evaluation area with a live model. Keyed with a Kino Flo Celeb 450Q through ½ gridcloth and a hard backlight provided via an Arri M18 outside the windows. Just inside, we strung up three nets of holiday lights — white and colored — and then stationed two 300W Betweenie Fresnels to provide direct flare and veiling flare evaluation. Again, two cameras were stationed side-by-side: An Arri Alexa SXT and a Panavised Arri Alexa XT. Evaluation viewing for both the bar and fireplace stations were, again, via Canon 4K DP-V2420 monitors in HDR mode. Finally, what was originally planned as a separate event but it was decided to incorporate it into the main Spherical Lens Day, the Clubhouse board room was turned into the “Re-Housed Lens Pavilion,” under the well-informed guidance of subcommittee member Christopher Probst, who initially proposed the event to the committee many months ago. In this “Pavilion” were rehoused still and vintage cine lenses from True Lens Services, GL Optics, Zero Optik, P+S Technik, Van Diemen and Whitepoint Optics. It was an impressive array of everything from Bausch & Lomb Baltars to Canon FD still lenses — all modernized for today's cinema production. An Arri SXT was also in the back room for the visiting members to evaluate the rehoused lenses. On hand to supervise each of the evaluation areas were ASC members Karl-Walter Lindenlaub, David Stump, James Neihouse, Steven Fierberg and Peter Moss. The event was only open to ASC members, associate members and their guests. 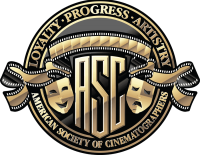 Some of the many attendees included ASC members Amy Vincent, Bojan Bazelli, Hoyte Van Hoytema, Steve Yedlin, Stephen H. Burum and Rodney Charters. Unlike large trade shows such as NAB and Cine Gear, this intimate setting afforded the ASC members the opportunity to really get up-close and personal with the optical choices and spend quality time evaluating the lenses as they saw fit. With well over 200 lenses to choose from, the attending cinematographers had the unique opportunity to evaluate a wealth of optics and many found new options for their future projects. The evaluation cameras were generously provided by Keslow Camera (which also provided several individual cameras for the manufacturers in their “booth” areas), grip and electric was provided by Cinelease, and additional support was provided by Arri, CamTec, Kino Flo and O'Connor.